Keeping your water supply pure and safe is easy with an advanced water filtration system from John’s Plumbing & Pumps Inc.
For over 60 years, our plumbers have been serving Roy and the surrounding region. And in that time, we’ve refined our methods and placed ourselves ahead of the curve – providing service that consistently stands apart from the competition. Water filtration system installation, repair, and maintenance from John’s keeps your system working at full-capacity year-round. We offer a full diagnostic inspection of your system to identify any problems or potential issues. Why install a home water filter? Installing a home filtration system comes with countless benefits. Many of our clients praise it as a permanent solution to low-capacity filters. Others appreciate its ability to efficiently remove excess minerals from well water that cause staining and damage to pipes, glass, and other building materials. A technician from John’s Plumbing & Pumps can help business owners determine which filtration system is best for their needs. Small and large businesses require different setups based on capacity and properties that rely on well systems need solutions different than those connected to city water. But before deciding, we take samples of your water and submit it to a lab for detection of pathogens, minerals, or other contaminants. This helps us customize your water filtration system so that you’re getting the cleanest water possible. Your water filtration installer will also consider water usage levels and how often the owner is willing to have the system serviced. This helps us find the right manufacturer for our commercial clients. There are two main types of water filtration systems. At-the-source water filtration which filters water at the main water line is the best method for properties that need filtered water throughout the building. 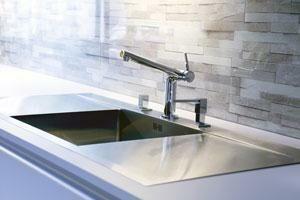 At-the-tap water filtration is a great option for safer drinking water. 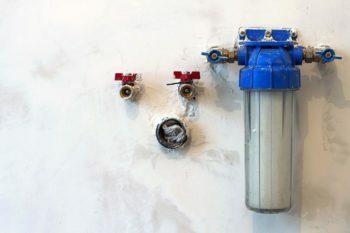 If this is your primary concern, installing filters on secondary lines and fixtures can be a more cost-effective way to get filtered water when you need it. Water filters reduce magnesium and calcium ions. These elements collect on surfaces including our hair, nails, and skin when we use hard water for washing. They can even build up inside the walls of your plumbing system, dishwasher, washing machines, and faucets causing damage to the systems we rely on in our daily routines. Hard water has even been linked to health conditions such as cardiovascular disease, reproductive issues, and diabetes, and neural diseases. However, the correlation has not been extensively researched. Water filtration systems don’t have to be elaborate or expensive. We work with our clients to find the most economical solution for their particular needs. Talk to us about installing a customized system for your home or office today.